Home » Angel Numbers » Angel Number 9 – The Spiritual Meaning? Find Out Now! Angel Number 9 – The Spiritual Meaning? Find Out Now! Angel number 9 is a philosophical number. Our universe is an intricate and beautiful mystery. It is bigger than many of us are capable of imagining. Nonetheless, there is interconnection to all things. Even on our small planet in our tiny part of the universe, the decisions and possibilities seem endless. It is easy to feel overwhelmed and insecure. There are many potential paths for each of us to choose from. Fortunately, we are not alone in our spiritual journey. We obtain support and wisdom at every turn. But it is up to us to see it. We all have guardians who watch over us throughout our lives. Notably, they want us to reach our full potential and lead fulfilling lives. To see these messages, keep your eyes open to the messages that appear in the form of Angel Numbers. By doing so, we gain a clearer understanding of our paths and our connection to the universe around us. Our angels teach us to focus our attention on the spiritual realm. It promotes personal growth and a stronger bond with the universal energies. If you find that you are seeing the number 9 everywhere, this is your Angel Number. Therefore, it has a special meaning for you. Find out what your guardians are trying to tell you. What does 9 mean? 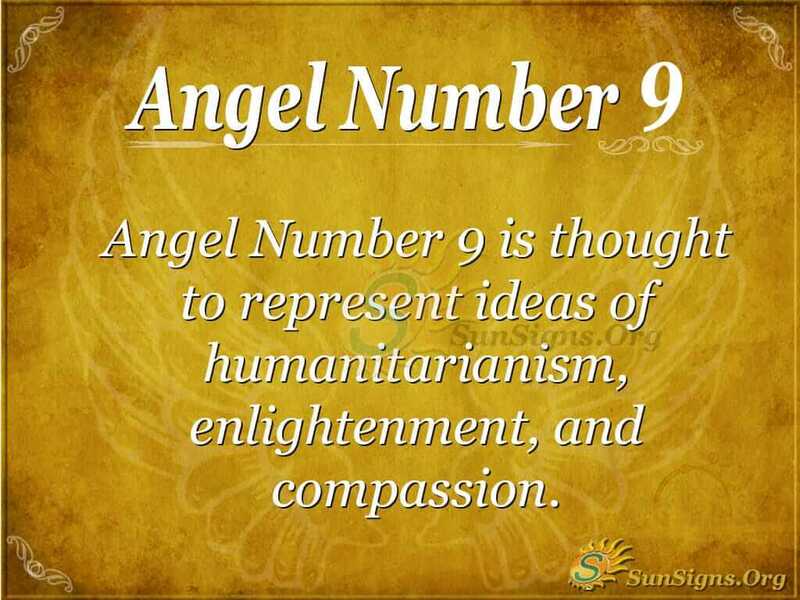 Angel Number 9 represents ideas of humanitarianism, enlightenment, and compassion. If you see this number before you, it is because your guardian angels are attempting to draw your attention to the humanitarian realm. It can mean many things, and of course, the message will vary depending on your situation. What Does Angel Number 9 Mean? It is possible that you need to draw your attention to the people around you. Indeed, your ability to empathize with people is going to be very strong at this time in your life. Equally, you have a great ability to get comfortable. Angel Number 9 might be a sign that someone close to you needs your assistance. Be on the lookout for ways you can help those around you. Know that by doing so, you might gain something important in return. Alternatively, the message might be much larger. If you have been considering pursuing a new career, then this might be your angels’ way of telling you that you should follow a humanitarian path. You will find that the humanitarian sector is where you find it easy to work. Surprisingly, this work brings you joy and fulfillment. What is Special About the Number 9? Truly, it can be impossible to know accurately what your angels are trying to tell you. However, if you are simply aware of their messages, you ought to focus your attention on humanitarian and philanthropic efforts. This way, it will become clear to you in time. Trust your instincts. Do what feels right to you, and remember to be open to the messages your teachers are sending you. In time, you will have a better understanding of your role and your connection to the universal energies. Generally speaking, we have consistent support from our spiritual guides. Moreover, we also have a deep connection to the world that surrounds us. We’re not alone. Focusing on the spiritual and humanitarian realms will allow you to widen your perspective and understand your inherent relationship with those around you. In turn, this might empower you to work in the humanitarian realm. Or find something that ignites a passion for you. Angel number nine is your link with charity and volunteering. Angel Number 9999 – Does It Mean The End? Angel Number 8888 – The Real Truth! Angel Number 7777 – Are You On The Right Path? Angel Number 6666 – The Devil’s Number? Angel Number 5555 – Find The Hidden Dangers! Angel Number 4444 – Does It Mean Danger? Angel Number 3333 – The Astonishing Truth! Angel Number 2222 – The Amazing Truth! Angel Number 99 – What Do You Need To Fear? Find Out! Angel Number 88 – Money Or Romance? Find Out! Angel Number 77 – Find It’s Impact On Your Life! Angel Number 0000 – Is it Good or Bad? Angel Number 888 – What Does It Mean Spiritually? Angel Number 666 – The Hidden Truth!